This week I am featuring three delicious vegetarian recipes. Hi April, this week I’ve shared 3 posts: one is my grandmother’s dill pickle cucumber recipe (so good!! ), one is a post on 5 ways to use patty pan squash (in season at the farmers market right now) and one is a sneak preview of some of the things I’ve been cooking for my upcoming book on fresh fruit and vegetable allergies. Thanks so much for hosting! I love your feature selections they look awesome! Hope you have an exciting week and thanks for a great party! I love your vegetarian picks this week April! I shared my cauliflower rice recipe to continue the theme! There are some great vegetarian dishes here! 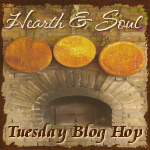 Thanks for sharing this blog hop!! Nice veg roundup this week! Thank you for the party, April!